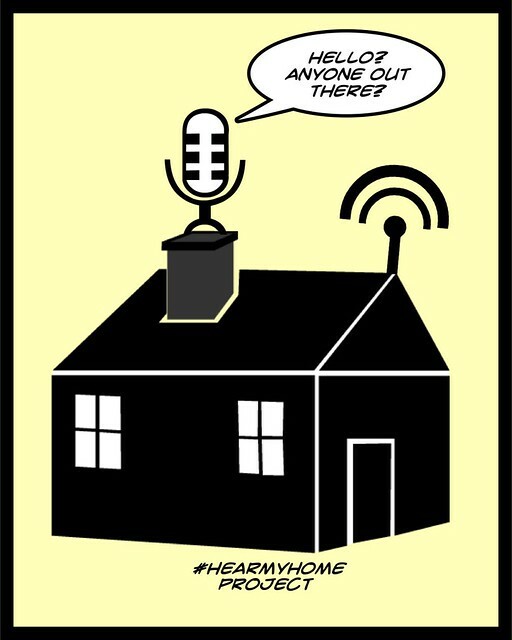 As part of the Hear My Home Project, we are being asked to do a Resonance Remix (or, a Sonic Remix — a great band name!) of someone else’s sound files. I chose my friend, Anna, who has been capturing the aural landscape of Philadelphia. I didn’t quite “remix” her files as add a few layers on top of her sound, by writing a short poem inspired by my listening and then adding images and gifs via Zeega. Maybe that is the resonance. Yesterday, thanks to a wintry late start at my school but not at my sons’ schools, I had time before school to work on two sound stories. One of the stories was the third Learning Event for the HearMyHome project, and the other was an assignment for the DS106 Daily Create. The Learning Event for HearMyHome (which is exploring the ambient audio of our lives as literacy moments) asked participants to find some rhythmic audio that represents their day, in some way. I had already done my morning coffee maker (!) but wondered how I might capture the sounds of my writing morning routine. Simple. I turned on Audacity, opened up Google Doc, and began writing a poem about capturing the keystrokes of writing a poem. 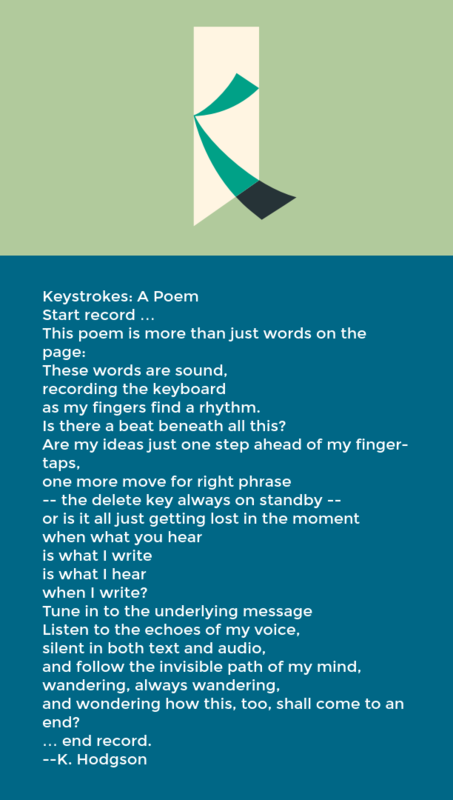 I then posted the sound with the poem, called Keystrokes. It is strange to hear my fingers cranking on the keys as the meta-poem unfolds (some slight editing happened after the recording ended, just to be honest) …. but there it is: a fair aural landscape of my writing mornings. Second, the Daily Create at DS106 asked us to be inspired by a SoundTransit audio file. At the SoundTransit site, you can pick geographic points and create an “itinerary” and the site will piece together ambient sounds from those places into a single file. Cool. Then, the prompt asks us to write a story, inspired by those sounds. I wrote a story about traveling from Beijing to Boston, with a stop in Kyoto, but then folded it into the soundscape itself, sharing it out as an audio file. For the second Learning Event for a project called Hear My Home, the facilitators referenced composer John Cage’s use of audience as musical composition, and suggested we try to capture the ambient nature of our world. I decided to head off in a slightly other direction, taking the four sounds that I had created and shared in the first Learning Event, and remixing them into a song of sorts. I added in some bass and some drums, and then cut up one of the sounds (basketball game) into pieces, allowing them to filter into the mix of the dog walking, the coffee making and the guitar chords I was tinkering with one day. I’m always intrigued by sound. Either with the emotional power of music — listening and writing — or with using soundscapes for telling stories. There’s something oddly cool with how we can use audio to capture our world. This past fall, I even did Sound Stories with my sixth graders. So I was interested in the launch of a project called Hear My Home, and I have been dipping in a bit at the start. Examining everyday people produced soundscapes, #hearmyhome inquires how hearing difference and listening to communities may re-educate the senses and attune us towards cultural difference. Ultimately developing materials that hear, recognize, and sustain community literacies and cultural rhetorics, #hearmyhome asks us to take heed of the frequencies and rhythms of culture as we architect, design, and teach towards more equitable landscapes for learning. I’ve done four “sounds” so far and shared them out in the Twitter stream (with the #hearmyhome hashtag). First, I took my dog out for a walk in the neighborhood. Second, I captured some sounds of my son’s youth basketball game. Third, I recorded my morning routine of juice and coffee. Fourth, I was working on some guitar chords with a new app. Just playing around. None of it is really special, and that’s the point. Capturing the sounds of everyday life, and then adding those sounds to a expanding mix of other everyday lives, has the potential to gather together an aural experience of our world. Take a listen. And then maybe join in? There is a sign up for newsletters, but you can bounce in anytime with the #HearMyHome hashtag. There’s probably a Facebook page, too. I don’t know.